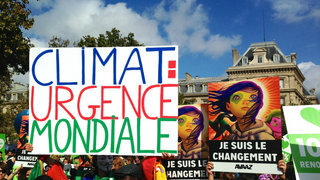 Climate Talks in Jeopardy as Industrialized Nations Threaten Kyoto Protocol | Democracy Now! lead negotiator on climate change for Venezuela. AMY GOODMAN: We’re broadcasting from Cancún on the Yucatán Peninsula in eastern Mexico. We’re here at the United Nations Climate Conference, known as COP16. It’s been one year since the U.N. talks in Copenhagen, the largest climate summit in history with more than 120 world leaders attending. The Copenhagen negotiations collapsed with no binding agreement to reduce greenhouse gas emissions and combat global warming. Instead, rich countries, led by the United States, met behind closed doors and attempted to impose an agreement on poor countries known as the Copenhagen Accord. This year, at the COP16 in Cancún, the ghost of Copenhagen looms, and the expectations for any real results are low. Just 20 heads of state from developing countries are expected to come to Cancún. No G20 country is expected to send a leader. The Cancún talks opened on November 29th, and after one week the fate of the negotiations is uncertain. At the center of the debate is the future of the Kyoto Protocol, the only treaty that binds almost 40 rich nations to cut their greenhouse gases until 2012 and commits parties to an extension. Last week, Japan said it would not sign up for a second period of the Kyoto Protocol unless the United States and China also sign on. This is Japanese climate negotiator Mitsuo Sakaba. MITSUO SAKABA: Kyoto mechanism, Kyoto Protocol itself, represent only 27 percent of global emission. It’s a relatively small part of the global emissions. So the continuation of the Kyoto Protocol in our fight against climate change is losing its impact. So, Japanese position is to seek the more global framework involving or with the participation of all major emitters to — in a legally binding way after 2012. That is the ultimate goal or aim of our government. AMY GOODMAN: The United States has long been criticized for never having ratified the Kyoto Protocol despite being historically the world’s biggest polluter. This is U.S. climate change envoy Todd Stern. TODD STERN: I mean, it may be that the problems with Kyoto completely tie this conference up, but I am very hopeful that that doesn’t happen, because I think it would be a huge mistake. With respect to — you asked would the United States be happy to have post-2012 world without a legally binding agreement. It’s not a question of being happy; it’s a question of trying to see what can be done in the real world that can make progress on this issue. AMY GOODMAN: The ALBA group of nine Latin American countries threatened to withdraw from the talks if Kyoto was abandoned. Claudia Salerno is Venezuela’s lead climate chief negotiator. She’s joining us here in Cancún. AMY GOODMAN: It’s very good to have you with us. Can you just explain what has taken place over the last week? This weekend, the ominous discussions of is this summit going to really be subverted, is it going to collapse because of Kyoto? CLAUDIA SALERNO: Well, we hope not. Actually, our position is that the continuity of Kyoto should not be controversial, because it’s a legally binding agreement, so we have to continue. It doesn’t have an expiration date. It have a first commitment period, and it is supposed to have a second one. So, it’s not a political discussion or a ideological discussion, like some countries actually point at us; it’s actually a legally one — it’s a legal one. The continuation of Kyoto cannot be put on negotiator — negotiations or condition. AMY GOODMAN: Why is Kyoto so important to you? CLAUDIA SALERNO: Kyoto is important for the world, because it’s the only legally binding agreement we have to actually control emissions from the big countries, and actually the historical responsibles of what we are living right now. So it’s not a matter of what is important for ALBA countries; I think it is important for the world to have them bind by obligations regarding the cut of their emissions. AMY GOODMAN: Talk about the significance of the countries we’ve heard are talking about not renewing. Japan is saying this, and of course that’s very significant, given Kyoto Protocol was hammered out in Kyoto. Canada, Australia. Why? CLAUDIA SALERNO: I cannot talk on their behalf, what I know, but Japan, he says that Kyoto just represents 28 or 27 percent of the emissions, and he would like to have an agreement, a bigger agreement, having everybody on board. What we replied to them is like, first, the convention has the 100 percent of the emitters there, and we want to like to think that all the negotiations that we are having under the Bali Road Map are actually meant to involve in a different way the emissions of the developing countries. That’s why we signed actually in 2007 the Bali Action Plan. So developing countries never said that they didn’t have a part to play in this responsibility; they were saying just that their responsibility is, and it has to be, different. So, secondly, the second argument for Japan, and that we actually say it all in plenaries and in private talkings, is that actually Kyoto has a resource for those countries that doesn’t want to be bind by it, which is Article 27, which actually allows whichever country wants to just get out of their commitments to denounce it. But politically, they have to take the decision to denounce the Kyoto Protocol and to get out in a legally way and not try to plot and to sabotage the whole negotiation just because they don’t want to continue. They can take the decision of not continuing, because Kyoto have provisions legally to do that, but they have to take the political responsibility to do it in an appropriate way and not sabotaging the whole process. AMY GOODMAN: When President Obama became the leader of the United States, did you think things would change? Bush was slammed by many for not signing onto the Kyoto Protocol. President Obama didn’t either, and now the Kyoto Protocol could be dead. CLAUDIA SALERNO: Actually, we like to think that the countries that are not parties of the Kyoto Protocol shouldn’t have the power, actually, to take decisions on a treaty that they are not part of it. And what it is, ironically, in the irony of how the system is functioning, is that the only country that is not party of the Kyoto Protocol have in their hands the power actually to the end of it. That’s unfair. And that’s unfair with the rest of the countries that actually signed to it and ratify it in a legally way. AMY GOODMAN: How does the U.S. have power? AMY GOODMAN: ”LCA track” means? CLAUDIA SALERNO: It’s, as I said, long cooperative action, and it’s the track that it is — the process that it is in the convention. U.S. is going to put in their obligations and their commitments in that track, which is not legally binding. And then the rest of developed countries said that they should do the same and just jump from the Kyoto Protocol, which is a legally binding, to a COP decision to have their obligations there. And that’s unfair, and that’s really ridiculous for them to think that developing countries are that stupid actually to go in the way to allow them to be jumping shippings, like if this was, I mean, a kind of a blackmailing of their obligations. Obligations cannot be blackmailed. Obligations have to be enforced and have to be fulfilled. And they have a compliance regime under the Kyoto Protocol that they cannot just say that they will not follow. AMY GOODMAN: And yet, [inaudible] talking about the possibility of your country and others pulling out right now, pulling out of these talks, right? Venezuela, Nicaragua, Ecuador, Bolivia. What — who are the countries that you really are spearheading here, saying if Kyoto dies, you’ll pull out of the talks? CLAUDIA SALERNO: Actually, I never heard any country, not even the U.S., saying that we will walk out. Never. And never ALBA countries said that we will leave this process if something didn’t happen, because what we actually criticize is that blackmailing approach, so we will not use it in our own. Not even in the worst moments of Copenhagen we left that room. We stood there for 36 hours, actually, without sleeping and without eating and without leaving our chairs, because we were committed to a good agreement, and we didn’t want them to impose us that paper that was illegal. So, in not even in the worst minutes of Copenhagen, we never, never left, and we will never, never left. The multilateral system is the only place in which all can sit and in which all can talk, and we don’t have any alternative but to actually talk until we understand each other and until we reach a solution for this. AMY GOODMAN: What is China’s role in these talks? CLAUDIA SALERNO: Actually, China has a very important role, because they show, being a developing country, that when you have the political will to be engaged, you don’t need actually to blackmail anybody, but just to put your commitments on the table and follow them. And China, even way before that little night in Copenhagen, when the little room was made, actually China, since October 2009, they put on the table their commitments, and they said that they will go and they will fulfill what they said. And they still are holding to what they said. They never withdraw their commitments, and they never blackmail anybody, just to do what they were supposed to do. And they are still doing it. And it’s even bigger, because they said that they don’t want to take any money from the system to do their actions. They are going to do that domestically funded. So that’s huge. I think that’s huge. And that’s a huge show, that when a country wants, a country can. AMY GOODMAN: Finally, Venezuela is one of the largest oil exporters in the world, provides a tremendous amount of oil to the United States, in fact. What obligations does Venezuela have to cut back its gas emissions? CLAUDIA SALERNO: Well, regarding the gas emissions, actually, yes, Venezuela is a good example of how to be green with being at the same time an oil producer. Venezuela represents 0.48 percent of the total of emissions of the world, less than one percent. There are small developing countries, islands, that actually emits more than Venezuela, being an oil producer. Venezuela is part of the Amazonian Basin. We have a long tradition of environmental engagement. We were the first country in Latin America to have a minister of environment and the first country in the whole region, in the whole America, to have a penal law for environment. So, we are really committed with the environment. And in that sense, Venezuela has a lot of domestically funded mitigation actions that we have been doing since 2007, since the moment that we actually signed the Bali Action Plan, not expecting — we didn’t expect to have the result of this process to actually start to doing our part. And Venezuela proudly can say now that we have changed, for example, our gas, our essence for vehicles, to be plomb-free, and that we actually start a very, very ambitious program to substitute bulb lamps. And now we have said that in less than a month, to be able to handle an urgent crisis that we had, because our energy is a clean energy, is water-produced. Seventy percent of the energy of my country is produced by hydropower, hydroelectrical power. As the rains didn’t came last year in the appropriate way, 70 percent of our energy was on stake, and we actually put on a plan to substitute bulb lamps as a way to actually mitigate and to help the hydropower to sustain. And we reached the goal of 60 million bulbs changed in one month, with all our communities engaged and people going house by house to explain people how to do that. And we reached a goal of 60 million bulbs, lamps, in one month. Actually, I heard that one developed country put on the table, one week ago, a goal to substitute 30 million bulbs in three years. So, Venezuela is engaged. We are doing our commitments without asking money for anybody, because our commitment is with the planet. And we are very proud to say that, yes, we are an oil producer, but our oil actually allowed us to develop a very ambitious social program that doesn’t also reach benefits for our people, but actually exports benefits for others, through, for example, health programs to just get back the eyes to people that have eye problems, which is called Mission Miracle. And we go to little village in all areas in Central America and in Latin America just to operate people to get them the view back, without charge, with no charge at all. AMY GOODMAN: Claudia Salerno, thank you very much for being with us, Venezuela’s chief climate negotiator here in Cancún, Mexico.